I found this plant with its funny looking flowers just a few hundred meters from our home in Chania. 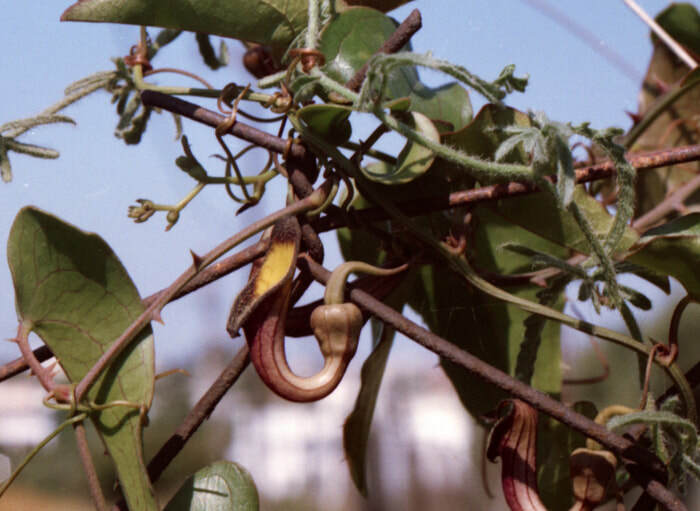 The plant is a perennial climbing woody vine, twining on shrubs and fences, up to 6 meter high. It is found in Southern Greece, Crete, Southern Italy and Sicily, mostly in moist, shady woods, bushes and hedgerows, but also in fields of rocks and on dry walls. So, its main distribution is in the north-eastern Mediterranean. It maybe introduced to Algeria. The leaves are evergreen and shiny, oblong triangular, alternate in a spiral. The lamina counts five-nerves at the base and is glabrous on both sides. The margin is entire to crenate. 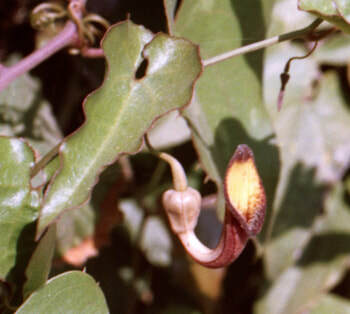 Aristolochia sempervirens has sessile utricles and unilabiate flowers. The flowers are solitary, axillary,and hanging down on long pedicels. The flowers are 2.5 to nearly 4 cm long, brownish-purple at the outside and yellow at the inside with a dark purple border and same throat. 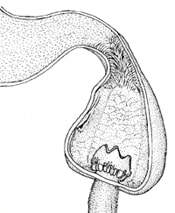 The pedicel is up to 5 cm long, glabrous at the base but hairy at the passage between pedicel and ovary.The calyx tube is glabrous on the outside, funnel shaped, strongly curved to U- to S – shaped. On the inside of the tube many fine hairs point in the direction of the styles; in the end of the curve, on the transition to the widened sphere which contains the anthers and styles, the hairs are very long, about 1 mm, where the inside of the tunnel is just over 1 mm! The flowers are called “entomophilous”. The pollination mechanism is very specialized: small flies and tiny cicades are trapped within the perianth tube via an elaborate system. Articulated hairs allow the insects to move in only one direction: inside the flower. When the flower is pollinated, the hairs subsequently wither to release them. Please take a look at the drawing: I have drawn a young hair and next to it a withered hair, did you notice the difference in size? The 6 stamens are fused to the styles with both the filaments and the anthers to form a gynostemium; the anthers dehisce via longitudinal slits. The gynostemium has five to six stigmatic lobes (“partially joined styles”). The gynoecium is inferior. The placentation is axile with numerous ovules in each of the six loculi. The ovary is hexagonal, oblong, 5 – 8 mm long and hairy. 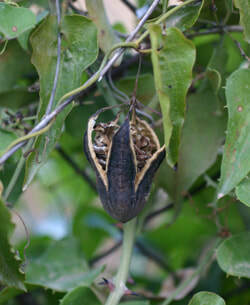 The fruit is a capsule, oblong – ovate, up to 14 cm long, and 2 cm wide, and opens with six valves at the base. 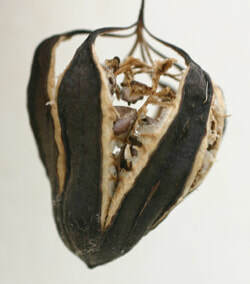 ​The seeds are cordate-ovate, 0.5 – 0.6 cm long, 0.6 – 0.7 cm wide, arched, glabrous and shiny on both surfaces, dark brown. The raphe lies on the concave side and is wedge shaped, 0.3 cm long, with approx. 0.1 cm wide wings. Please look at the four details of the seeds at the bottom of the drawing. Fresh seeds have a prominent white elaiosome, so we can assume that ants take care of the dispersal. This species is very homogeneous. Only slight variations in the size of their leaves and flowers have been observed. 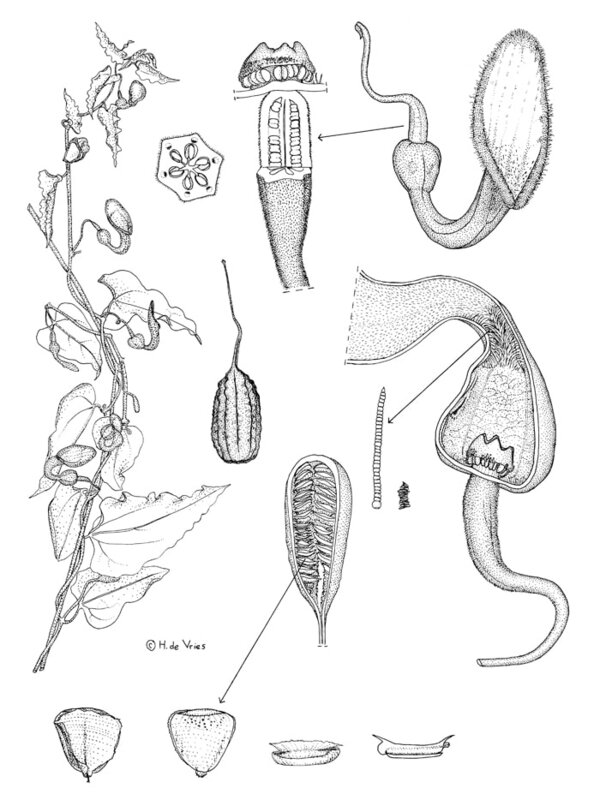 H.de Groot et al., Botanical Journal of the Linnean Society,2006,151:219-238. Take precautions that you obtain legal permission to use the drawings that you use. Obtaining license of image and drawings rights is a very safe way to proceed. The next best thing is to secure written permission. Never use the images until you have written permission or unless permission has been granted on the website itself by the web master. You need a drawing? Hit the copyright button and read how to obtain permission !! !